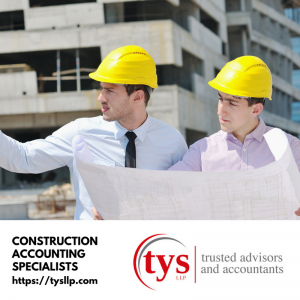 Small construction companies or sub-contractors in the construction services industry have many financial challenges to consider when running their day to day operations. Key to ensuring prosperity, success and stability in the industry is preparation and sound management. The best way to simplify management and assure accuracy and accountability is to hire an experienced accounting services firm or CPA. The benefits of working with an accounting firm begin with proper management. If a company is not properly managed, contractual misunderstandings, tax code and compliance errors, job tracking and job costing mistakes and, labor cost errors could cost the firm thousands if not tens of thousands of dollars in lost revenue or worse. Further, when you partner with a reliable accounting firm with decades of experience in the construction market, in addition to their ongoing industry knowledge you also benefit from their tried and true relationships. They know bankers, bonders, and law firms and how to work with each of them to provide valuable advice and insight in handling your accounting to maximize your workflow and ensure that your firm represents the best practices of the industry. In addition to providing expert accounting, your team will help you think and work within a long-term framework. They help you manage your money efficiently and record all your project-related expenses accurately. This area alone is one of the most time-consuming and important as it represents a significant amount of work and focus that would have to be done by the business owner. Knowledge sharing is another essential area that is offered by the accounting professional. He will help you understand how to properly allocate labor costs, material costs, and subcontractor utilization. Add to that expertise that helps you categorize indirect costs for supervision, equipment, tools and insurance. Can you imagine having enough time to run your business, oversee construction project and bid on the next job and still try to handle the accounting of your business operation? It is easy to see how invaluable having a depending accounting partner can be? Contracting and construction firms must also have aggressive cash management and reliable financing and bonding programs. Your CPA firm will also position your business to better capture revenue, reduce overhead costs, and keep bids coming your way from your best customers. Your firm will also be responsible to inform you of your options when it comes to every aspect of working with the IRS. From filing tax returns for your company to knowing how to qualify to report income and on what basis. For example, does your firm qualify to report income on the cash basis or the accrual basis on which saves you more money? Your CPA will help you determine those highly important decisions. For the year of completion, you report the remainder of the contract income. Contact us on the West Coast at 925-498-6200 or the East Coast 585.678.9015.